This entry was posted in #ReaderFriday, #writers. #ReaderFriday by Sue Coletta. Bookmark the permalink. Rugelach. When the kids were home, it was an assembly line process, but I still make them now that it’s more of a solo operation. I haven’t had Rugelach in years, Terry. Growing up, my best friend’s mother used to make them. Delicious! Lasagna because we’re not big turkey or ham people. Break out the ricotta and the garlic bulbs, yum! Next month is our 29th wedding anniversary, and we’ve been cooking Christmas lasagna as a married couple . . . forever! Oooh! I love biscotti. (Sometimes I think a “plain” cookie is far better than a fancy one.) I’d love your recipe. I have a lot of cookies I bake every year (some family traditions going generations back, some I started making the first year I was married), and I make truffles, too. But my favorite traditions are the savory ones, particularly the Feast of the Seven Fishes on Christmas Eve. It’s my favorite meal of the year. Christmas Day is usually prime rib and some kind of homemade pasta (noodles or ravioli). The New Year’s Eve and New Year’s Day meals are the same every year, too (also going back generations). And of course, bagna cauda at midnight. And I’ve been making tiramisu (I think I gave you my recipe) for dessert since the first year I was married. Indeed! Yes, your tiramisu recipe is so yummy! I’ll be making it again this year. 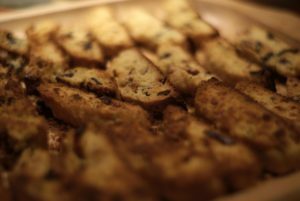 Happy to share the recipe for biscotti. This makes about 80 cookies. 2 1/4+ C Whole almonds, either skin off or on. Your choice. Preheat to 350* Then lay almonds on baking sheet and bake 8-10 min, or until (very) lightly brown & fragrant. Let cool & chop into pieces. Reduce oven to 300* & line baking sheet with parchment paper. Whisk flour & sugar, baking powder, salt. Stir in almonds, then egg, till dough forms. Divide dough into 4ths on lightly floured surface and roll each into a log, about 3″-4″ wide. Transfer logs to baking sheet & bake for about 35 min. or until firm to touch (log will spread during baking). Let cool on wire rack for about 10-15 min. Then transfer to cutting board & cut logs into slices about 1/4″-1/2″ thick on the diagonal. Place slices on baking sheet and bake an additional 10-15 min. per side until firm. For crunchier biscotti, bake longer. Awesome. Thank you. I’m going to compare it to the different family recipes (each of us has a favorite). I love almonds, so I know this will be high on my list! Now that I am intolerant to many types of carbs (with or without gluten) I am looking forward to baked apples. Strangely and a bit against the rules of the low-carb diets, one apple in the evening still works like a treat for me. Sue, thanks for mentioning them and for the picture of them in the oven. I have never baked them, but I did love to taste them with espresso many years ago. The photo of biscotti is in the public domain. Feel free to use it. The only time I eat dessert is at my mother’s, where our dispersed family meets for birthdays and holidays. Her pecan pie is cosmically wonderful. Ooh, I love pecan pie. The holidays are the perfect time to indulge. Enjoy, Mike! My grandmother made Christmas cookies even though we are Jewish. A big box of meringues, powdered sugar cookies, and buckeyes would arrive at our house. My mother made meringues and Chanukah shaped sugar cookies. Today, my daughters help Grammie with the meringues. Latkes will be on the table on Monday night as they were when my grandmother was little. I prefer the Israeli tradition of sufganiyot, jelly doughnuts, but anything fried in oil is traditional. Recipie for meringues: https://www.tasteofhome.com/recipes/vanilla-meringue-cookies/ turning off the oven and going to bed works well too. In the morning, little puffs of wonderfulness. My mother adds some juice from a jar of Merichino Cherries to the mix. Wonderful pink cookies. Aww, I love that your mom shares her tradition with the grandchildren. What special memories they’re making with Grammie. Thank you for the recipe link, Alan. Shared to Pinterest and bookmarked. 🙂 Happy Chanukah!!! Holidays at the Sands household mean adding eggnog to the brandy.